Pat Murphy told me recently that as far as he knew the Cross on the Green was originally erected in 1913 by the local community. It followed a visit by a priest from the missions who came to preach in the parish. A collection was taken up and offered to the man, who was staying locally and travelling about spreading the Gospels and describing his overseas work. The missionary refused the money according to Pat, but as a consequence, it was decided to put the money to some “spiritual” use. Just how a decision was made can only be guessed but it was decided to erect the Cross. And if the photo below is anything to go by, the unveiling (if this is indeed such) was a very large occasion. The Cross was moved from the middle of the Green, probably sometime in the late 1950’s. It was put in the top corner of the Green,just behind where the present grotto is located, on a rocky outcrop. At some point, again according to Pat, Denny Murphy and Tommy Doherty did some remedial work to hold it all together including an iron bar support placed at the rear. The Cross, in this position, was a regular meeting point as it was on a direct line between the Mount and the back road, when people took the short cut through the “Knock”. Many were the weary fisherman that trudged home that way including Paddy and Christy Doherty who kept their boats at the lower quay. I remember sitting there as a child, particularly as the sun set over “Snow Hill”, getting the last of the summer sun. At that stage the blackened timber was beginning to crumble particularly at the base, and we often joked that the woodworm must be holding it together by joining hands. I can also remember my Aunt Ellen complaining that the Cross should never have been moved and that Cheekpoint would never have luck until it was returned to its original location. It may have been that, but more likely its imminent collapse, that spurred my Uncle, John Doherty, to move it back to it’s rightful place in 1980. Another memory is of the figure of the crucified Jesus in John’s shed as he repaired the plaster from which it was sculpted. 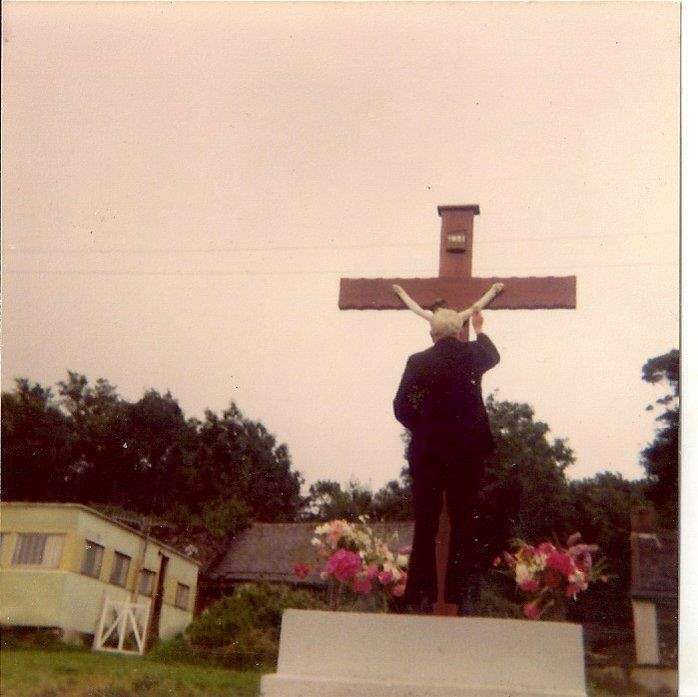 His brother in law Paddy Connolly who was a gifted carpenter, constructed a new teak cross onto which the figure was remounted. The teak cross and repaired figure was repositioned on a new stand and steps. These were constructed on the green by John and Alf Doherty, and probably others helped too, that I have no recollection of. Sadly the only memory I have of any religious use that it was put to, was when the village gathered to say a rosary around it in the hope that my brother Joseph would be given back by the River Suir. He was drowned on Sunday August 10th in 1980 and his body found on Thursday August 14th. According to Pat another cross was erected in Passage East, at the same time as the Cheekpoint Cross, and arising from the same circumstances. Pat thought it may have been much smaller and placed in a window of someone’s home. The Cross is probably a little taken for granted now, but thankfully as in the time of my youth, it still remains a gathering point for our young and not so young. the meeting point of the three sister river network, the Barrow, Nore and Suir. pilotage, and port works. Most of this activity centred around Cheekpoint Quays. I would imagine that the present Main quay was constructed around the time that the Mail Packet Station moved to the village. The Lower Quay was probably a later addition. The Station was created in Cheekpoint in 1785 by Cornelius Bolton (the younger). 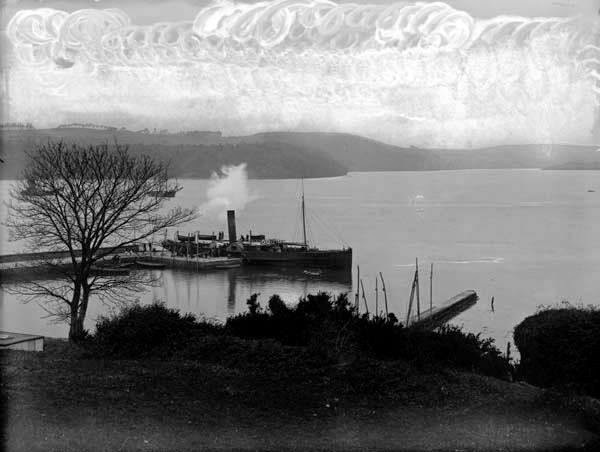 Cheekpoint Quay would have been the point of departure for all mail, including some freight and passengers, from Waterford to Milford Haven in Wales during that time. The station operated until 1813, when it was moved further down river to Passage and then to Dunmore East in 1824. With the coming of steam driven ships, the station as finally moved to the city around 1837. Years ago Christy Doherty of Marian Terrace told me a story of a paddle steamer calling at the quay and he as a nipper hoping aboard and with his family heading downriver to Duncannon for a fete. 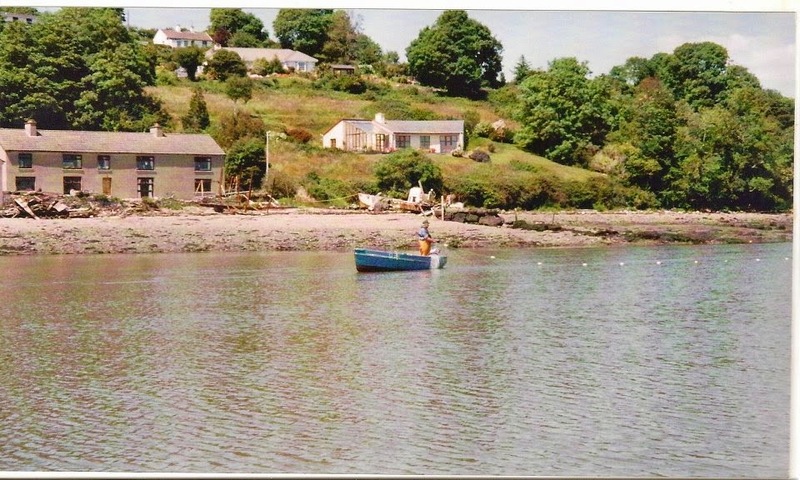 Christy said paddle steamers regularly called to Cheekpoint quay and he likened it to a modern day bus stop! Initially I thought he was spinning me a yarn. This photo proves otherwise. The quays were used to create a safe harbour for the fishing fleet in the past. The boats included punts, prongs and sailing yawls. When not in use, boats such as the punts and prongs would be hauled out on the green to be dried, repaired and painted. The sailing yawls were eventually fitted with engines to become motor boats. Some of which can still be found in use in the estuary today. The prong, a barrel shaped boat, is unique to the area. It was renowned for its ability to be launched across the mud flats which are in abundance here. Its curved bottom allowed it to slide effortlessly across the mud and into the river, at even the lowest of tides. The timber punts of old are slowly being replaced with plastic, but some examples still remain. 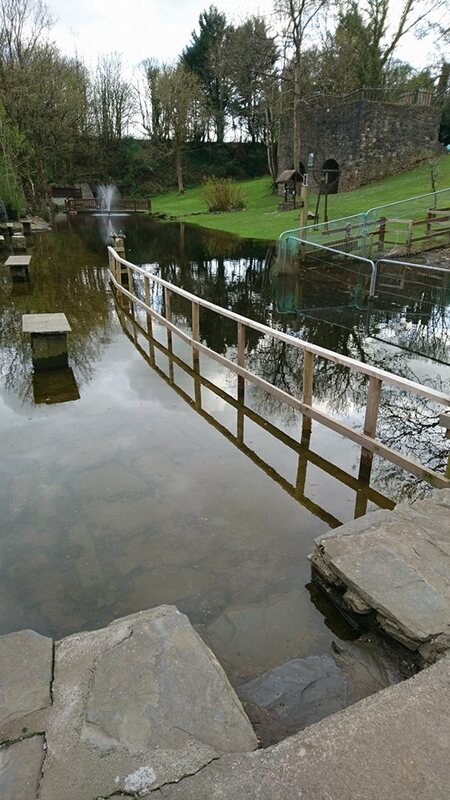 These are well worthy of retaining as are the skills of making, repairing and maintaining them. As children we used the quay as one of our main playareas. This included football or hiding go seek on the green, swimming between the quays or hand lining for flounder or crabs. It also included a lot of jumping in and out of boats and of course gazing at the activities of the fishermen. season began on Feb 1st and continued till Aug 15th. employed up to 30 punts with a two man crew in each. 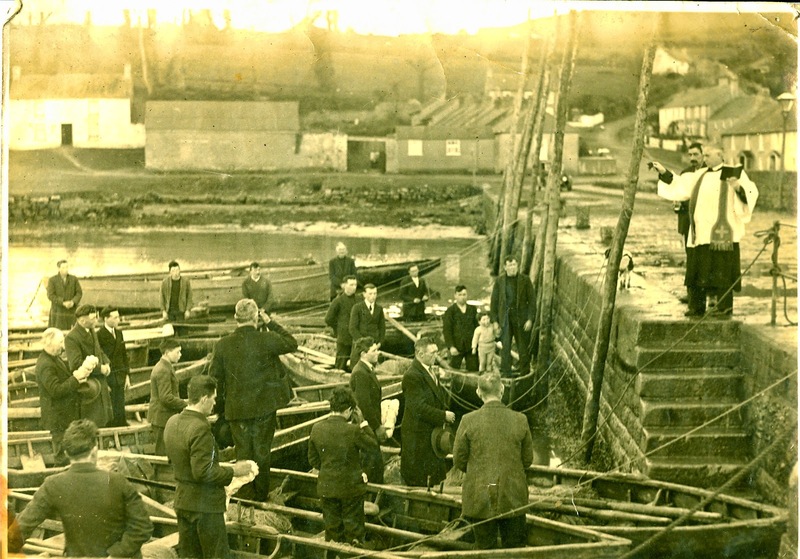 On Saturdays the nets were hauled out and crews would stand around the quay “ranging them over” and mending holes caused by fast swimming fish or from snagging fouls in the river while drifting. was also used. 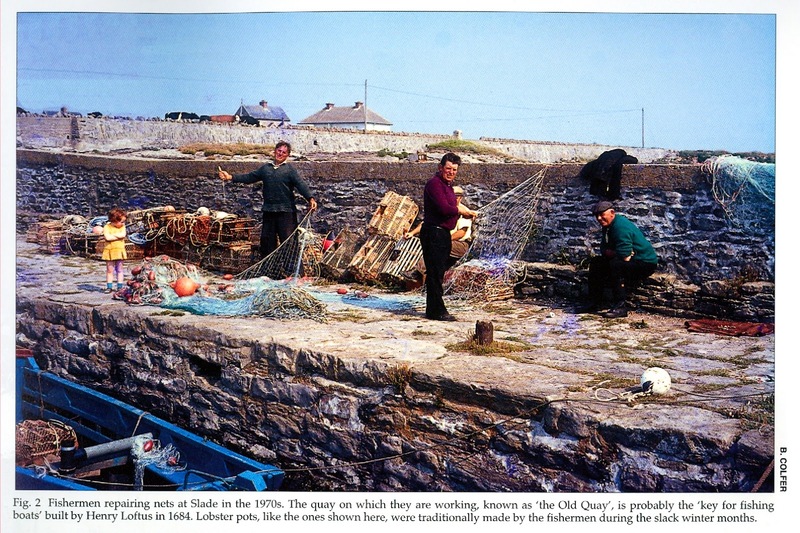 My lasting memory of trawling is with my father and uncle John. We had been “dragging” for a few hours and “hauled up” to see what we had caught. I don’t remember anything other than a very large conger eel that day. It trashed about in the net and when it finally got free it slithered about at a tremendous rate all around the deck of the boat. I remember standing on the gunwale while the two men battled to bring it under control and heave it over the side. The purple skin, dark eyes and slimy residue all left a bad image of this particular fish on me, one that still remains. Another distinctive factor in the Cheekpoint fishery was the use of Weirs. An example of which can be seen above the main quay. These could provide year round fishing, and were a major contributor to the net worth of those families lucky enough to possess one. There was much of the weirs around the green and quaysides growing up, from making or repairing the net used to the actual poles that were driven into the riverbed to repair them. Eels were also fished from the quays here, and it was a summer fishery. Eels like the heat and during winter disappear into the river mud to sleep. They emerge when they decide its warm enough and feed voraciously. This feeding frenzy suited the fishermen well and using a baited fyke (fyffe) nets they managed to capture plenty. The Eels captured had to be kept alive in the river prior to their sale, and were exported live to the Netherlands. The buyers would arrive on the quay with their water tanks on the back of trucks and the fishermen first weighed the eels and then loaded them into the tanks for export. There was always a few escapees that required our willing attention. required the Yawls, later motor boats, with a crew of initially four, but latterly three, and was a drift net fishery also. would have also been important, dragged up or picked directly from the rocks. 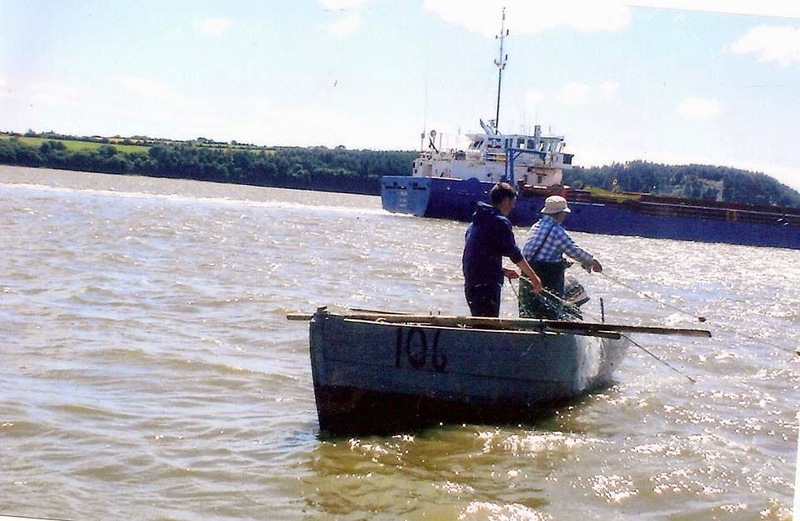 Although the fisheries have suffered many setbacks in the last ten years, perhaps the worst impact on the Quays was the construction of Groynes by Waterford Port Authority. The Groynes were constructed by dumping tens of thousands of tonnes of rock into the river at right angles to the river bank with the intention of keeping the Cheekpoint sandbank cleared. It worked better than the authorities said they expected, and the casualty was 24 hour access to the river for Cheekpoint. 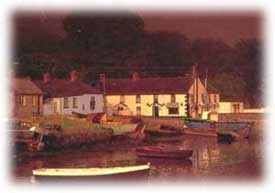 Today, Cheekpoint quay still retains a hint of its past hustle and bustle, but what remains are only hints. Gone is the energy and excitement, gone is the huddled groups of sea booted fishermen swapping news, gone is the economic vitality it generated. Recreational use may bring some vitality in the future . However an equally essential ingredient, if only for the rich memories, will be some element of an economic fishery. nonsense system that demands you be on time, or you won’t be paid. tenacity of any good hunter following his prey. Saturday was giving over to repairing nets and Sunday to rest. The drift net was used in Cheekpoint, employing two men to an open 18ft punt. . We used a set of 6 nets marked by buoys on either end. 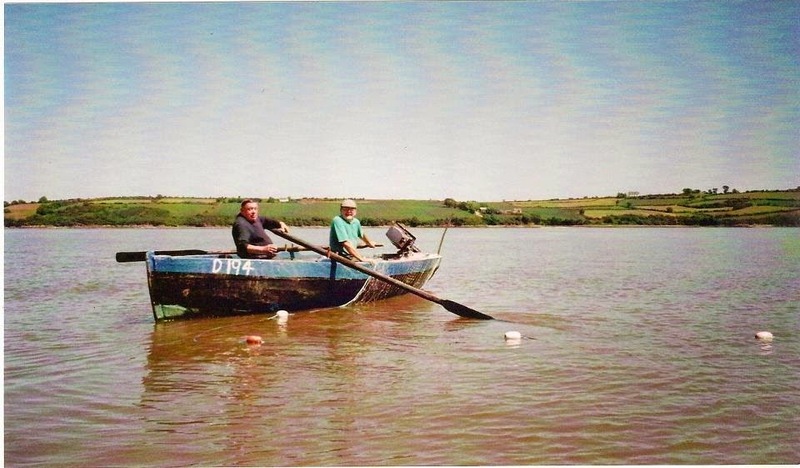 Originally punts were oar powered but outboards made things a lot easier in getting about to the drifts. the river it was known as “First of Ebb”. three hours for the chance to be first boat to set on the Stripin. tide would stop running out of the river and start to run in again. onto the rock marking a change in the tide. shallows, or prevent them getting round the inside end of the nets. the tide strengthened this was called “Flood Tide”. continued to High water and the whole process was repeated. I wrote last week about the earlier origins of Kilns and this post focuses on the design and methods employed. The local design is of a block shaped building of cut stone into which is built a firing chamber, lined with firebricks and insulated with rubble and clay. Recent damage to one of the kilns at Jack Meade’s highlights the technique. Generally, the kilns (in many sources referred to as draw kilns), had a similarity in design, although variations occur due to local building technique or materials. The firing chamber might also be known as a combustion chamber, crucible, bowl, well or a pot. The chambers resembled an egg standing on its narrow end with the base and top removed. Generally smooth, this allowed for the lime to slip down and be removed at the base. There are recordings of this design causing the death of some lime burners or others who slipped in and could not claw their way out of the noxious fumes or stifling heat! Chambers were loaded with a charge initially – something flammable such as furze or very dry timber which would get the fire going. Onto this the layers of limestone were added with an extra layer of firing material to keep the chamber burning (three to five layers of stone to one layer of firing material). The fuel could be more timber but was probably coal slack or calum. Coal slack is the thick dust that can be found at the end of a coal bucket and was something my grandmother prized for “keeping in the fire” She often collected it for a few days and then wetting it, she would place it over a well lit fire and it kept the fire burning for longer. There is a long tradition in Cheekpoint of importing Welsh coal. There could be more than one draw hole, which seems to have been a technique to avoid ash being mixed with the lime. It also allowed more air into the chamber. I imagine these holes could be blocked if required to adjust the burning. The Lime was drawn off into barrels apparently and then loaded onto carts for delivery to farms. All our local kilns feature a Romanesque arch around the draw hole which provided access to the draw hole and also shelter for those working on them and a place to store tools. Local design seems to have favoured a double kiln. The reason for this would appear to be that once a fire had been lit and the heat had been established in the kiln, it was much easier to get the next burn going and it quickened the process. was added to the chamber. Jack Meades. It’s probably worth mentioning that the double kiln in the field above Jack Meade’s was actually a single kiln originally as can be seen from the distinctive different materials used in both sides. The piece on the left is much younger I would think, which would lead you to speculate on the age of the other. This is in a much greater state of disrepair. 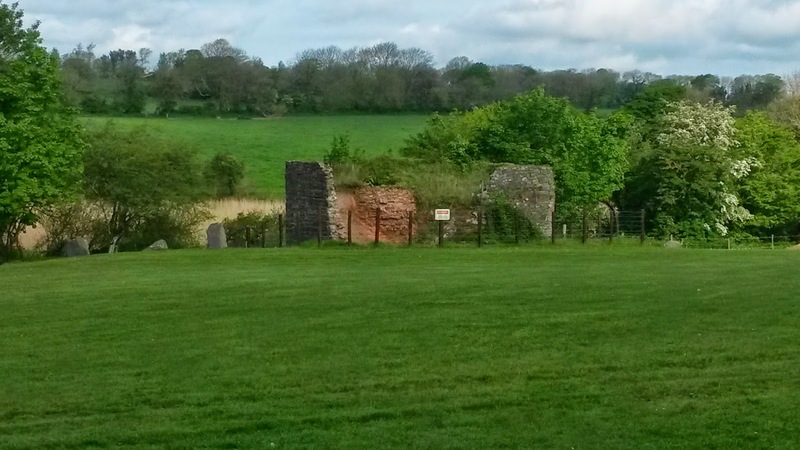 As a child I was intrigued by the building called the Limekilns in Cheekpoint. When I asked my father what it was for his answer reminds me of what I tell my daughter when she asks what the internet is…He said it was for making lime, as I might say its a means of getting information. When as an adult, fishing the river, I noticed others up the Ross River as we sometimes called the Barrow my curiosity was piqued again and at some stage, pre Internet days, I managed to get some written information that began to lift the curtain from my eyes. We do know, for example, that when Arthur Young did his Tour in Ireland and book of the same name, he stopped on two occasions with the resident landlords of the area, the Boltons. He recorded much of their entrepreneurial endeavours amongst which were Limekilns at Cheekpoint, Faithlegg and Ballycanavan (Jack Meades). His visit was 1796 and his second in 1798. The book is available on googlebooks for free here. Young tells us that the “progressive” Boltons had set the Kilns up to add lime to the fields in order to fertilise and enhance the crops and their yield. He also mentions that they sometimes dried salt on the top of the kilns (presumably for use in preserving). I also learned from other sources that many landlords actually encouraged their tenants to spread lime by offering free seed or other perks, suggesting that the tenants were possibly sceptical about the process? Kilns were sited close to water as the lime stone, which was burned, was generally ferried by water. In the Suir and Barrow, the boats used were termed Lighters – so named because they were used to lighten the load of sailing ships who could be held back from port by sandbars etc. These had a three man crew one held the tiller and two pushed the flat bottomed craft along using poles. They drove them into the water and pushed from the bow to the stern to get the boat along. The crew also loaded and unloaded the craft which was no mean feat. 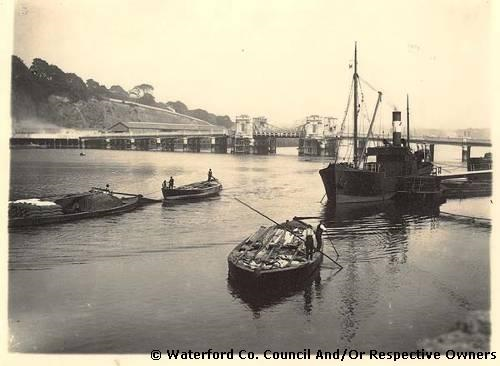 I read recently that there were 150 Lighters working the Suir alone between Waterford and Carrick into the late 19th Century. However it was at the stage that I cam across Shire Publications and ordered my copy of Limekilns and Limeburning by Richard Williams that I finally had the completed answers to the process of the Limekiln. Lime has been around since about 6000 BCE and was used by the Mesopotamians. The Greeks later used it in footpaths but it was the Romans who seem to have taken it to the building and agriculture level. Some examples have been found from the Roman period in the UK. 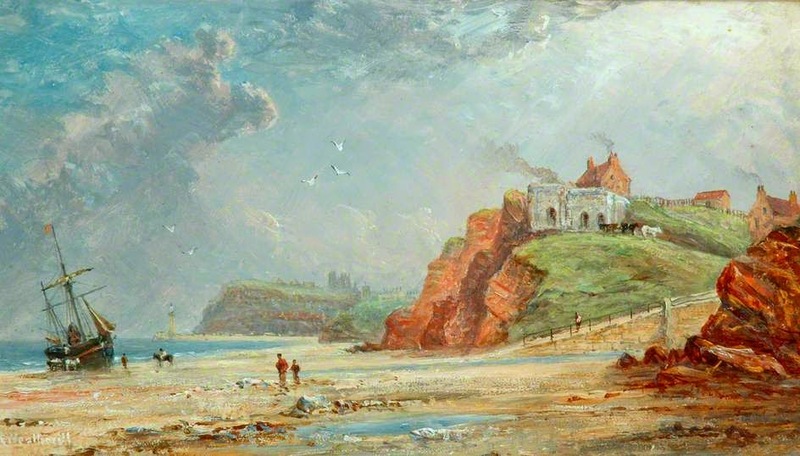 There is evidence that the early Christian period used lime to wash houses and the Normans certainly burned lime to assist in their castle, church and bridge building. These kilns tended to be temporary builds and were left to deteriorate after the initial need for lime in building had passed.